Dr. David Ramsay : Surfing on Pitcairn Island, 1821. The Scrapbook of the Log of the Ship "Surry", Pitcairn Island April 1821. Following an extended stay at Matavai Bay in Tahiti in 1788-1789, Midshipman Fletcher Christian led the infamous mutiny on the Bounty, setting Captain Bligh adrift in a longboat. After returning to Tahiti, Christian was desperate to find a sanctuary from punishment by the Royal Navy and eventually settled the then uninhabited and remote Pitcairn Island with some of the mutineers and a number of, mostly female, native Tahitians. 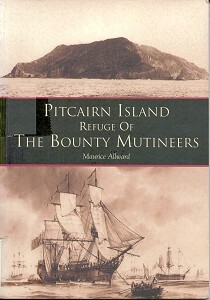 As the mutineers progressively eliminated themselves by misadventure or murder, Pitcairn became a integrated culture of English and Tahitian influences. The island settlement was discovered in 1808 by Captain Folger in the Topaz, who reported his surprising find to the British Admiralty. A number of vessels visited the island before the Surry in 1821, when the inhabitants were observed surfing on small boards. In 1823, a British whaler, Cyrus, left two of her crew on Pitcairn, John Buffett and John Evans, who provided an injection of European influence, but this was minor in comparison to the significant social dislocation resulting from the arrival of Joshua Hill in 1831. Due to the pressure of an increasing population on the small island, several attempts were made to relocate the inhabitants before there was a major relocation to Norfolk Island in 1856, where the descents of the Bounty mutineers' continued their enjoyment of surf-riding. Whereas European influence on Pitcairn was principally evident in a resurgent Christianity, Polynesian culture maintained a strong bond with the ocean, most notably a continuation of surfboard riding in relatively difficult conditions. In particular, note"a flat board about 3 feet long, on the upper side smooth and on the under a ridge like a keel", page 7. The "ridge like a keel" appears to be a design feature intended to give the board directional stability, commonly known as a fin and usually accredited to Tom Blake in 1935. As such a feature is not recorded in any of the reports of traditional surfboards of Tahiti or the Hawaiian Islands, it is likely that the Pitcairn board was developed in a combination of the Tahitian's native design and the European seaman's knowledge of boat building. Research Note: Ramsay's account of surf-riding on Pitcairn Island was previously identified on The Museum of British Surfing web page. "Please note that our web history has been withdrawn while we redesign the website." This is a copy of the scrap book of the log of the ship "Surry" (Captain Thomas Raine) written by the ship's doctor (Dr. Ramasy) giving an account of their visit to Pitcairn Island in April 1821. We saw the Island early next morning and got up with it in the afternoon, we were going round the island when I observed the English flag on the S.E. side and we immediately hauled up for it, we soon observed a canoe coming off and two of the inhabiants in it - they asked how we did in pretty good English - we hove to and they came on board - soon after other canoes came off and all came on board - they appeared highly pleased to see us and invited us on shore. The Captain, 2nd Mate and myself went into the gig. On our approaching the shore the danger from landing through such a surf obliged us too lay on our oars till the canoes which we had got ahead of came up to us. Then we were quite enraptured the mountainous height of the land, the abrupt precipes, the roaring surf and the coppered natives on the black rocks, their fairy forms now seen now hid by the dashing wave seemed the genii in the fancied regions in Alladin. But we were afraid to land as there is no beach and the breakers running high, we waited till the men in the canoes came up with us and they should show us the way to get ashore. The channel formed by large rocks being very narrow, it requires great caution in the surf. One man Quintrel swam out to us to watch the signal and tell us when to pull in, another stood on a high rock with a branch to wave to him, the rest stood on each side of the rocks showing the passage through which the boat must go. The man on the rock seeing the sea smooth gave the signal and in we went. ... took her all of us having got out on their shoulders and carried up into the shade. The Capt returned and told me that after loading the boats which was done by swimming through the surf with the fruit, they to his great astonishment amused themselves by taking a flat board about 3 feet long, on the upper side smooth and on the under a ridge like a keel, and went out on a rock and waited till a large breaker came and when the top of it was close on them, away they went with the piece of wood under their belly on the top of this breaker and directed themselves by their feet into the little channel formed by the rocks, so that men the surf left them they were only up to their knees in water. They are very dexterous in keeping off the rocks which to us would be inevitable death. Their method of swimming is like the dog but inclining a little to one side. The road from the village to the beach is very steep and narrow in some places but both men and women run up and down with great ease with a load on their shoulders and were very deirous of carrying us up or down any difficult place. Log of the Ship "Surry", Pitcairn Island April 1821. - The Incredible Adventures of True-life Robinson Crusoes. The following quotation was forwarded by Peter Robinson, Director of The (British) Surfing Museum in June 2009, who is awaiting access to the original ships documents held by the National Maritime Museum. "They have a piece of wood, somewhat resembling a butchers tray, but round at one end and square at the other, and having on the bottom a small keel. With this they swim off to the rocks at the entrance to the little harbour, getting on which they wait for a heavy surf, and, just as it breaks, jump off with the piece of wood under them. And thus with their heads before the surf, they rush in with amazing rapidity... ...they steer themselves with their feet which they move very quickly." Angus and Robertson, 89 Castlereagh Street, Sydney,1965. Chapter VIII: The Surry and the Russell. Nicholson relates the arrival of the Surry off Pitcairn, the difficult landing and quotes Ramsay's account of the Captain's observarions of surfriding, as reproduced above on page 7. 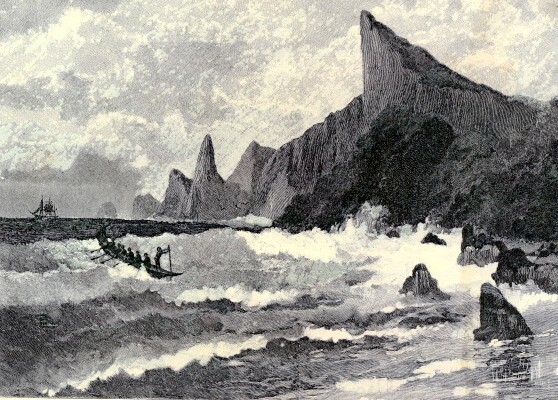 In Captain Raine's own account of his visit to Pitcairn, he described the surfboard riding of the islanders by their own term of "sliding". The surfboard "somewhat resembling a butcher's tray, but round at one end and square at the other", was used with equal dexterity by both the men and the women. Captain Cook refers to surfboard riding at the Sandwich Islands during his voyage there, but makes no mention of it at Tahiti. As there appears to be no early record of the sport in Tahiti, it seems that "sliding" was developed by the young inhabitants of Pitcairn Island themselves. 1. "he described the surfboard riding of the islanders by their own term of 'sliding'"
This translation corresponds with the Hawaiian term "papa hi naru' [papa he'e nalu], (wave sliding-board)" and has similarities with the Tahitian "a small board, which they called 'papa fahee' ". See: Rev.William Ellis : Surf-riding in the Society and Sandwich Islands. 2. "Captain Cook refers to surfboard riding at the Sandwich Islands during his voyage there"
Strictly, Cook himself never wrote about surfing, altough some accounts by his marineers were attributed to him by editors of the journals in the 18th century. 3. "As there appears to be no early record of the sport in Tahiti, it seems that "sliding" was developed by the young inhabitants of Pitcairn Island themselves." Clearly this assesment is incorrect. The first European report of surfing was by Joseph Banks on Tahiti in 1769 on Cook's first Pacific vovage. See: Joseph Banks : Surfriding in Tahiti. Furthermore, William Bligh reported surfing on his visit to Tahiti to obtain breadfruit plants (before the mutiny) and the most detailed 18th century account, including the first report of surfboard riding surfing in a standing position, is by Bounty mutineer, James Morrison, after his return to Matavai Bay, circa 1788-1789. 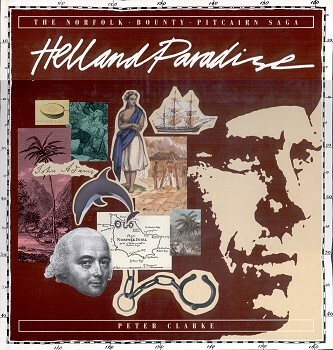 Hell and Paradise: the Norfolk - Bounty - Pitcairn Saga. Viking- Penguin Books Australia Ltd.
Victoria, 3134, Australia.1986, Reprinted 1998. An excellently written and lavishly illustrated book that connects history of the mutiny on the Bounty and the settlements of Norfolk and Pitcairn Islands. Clarke implies Folger (1808) also observed surfboard riding, although since he remained at Pitcairn for only ten hours, this seems unlikely, see Note 2 below. 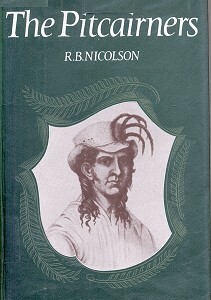 Unfortunately he compounds Nicholson's major error in surfriding history: "Captain Cook had reported that surfing was unknown even in Tahiti and, when he came across it in the Sandwich Islands, he believed it to be unique", pages 91-92 (see notes, above). The book includes a rare colourised reproduction of Weber's famous "A View of KaraKakooa, in Owyhee", circa 1778, pages 32-33. Their lives were extremely simple. Subsistence farming and fishing occupied most of their daylight hours, interspersed with occasional recreational activities such as kite- flying, stilt-walking and a sport which they appear to have developed spontaneously - surfing. ...and, when he came across it in the Sandwich Islands, he believed it to be unique. Clarke reproduces the quotes of Ramsay and Raine on surfboard riding as noted by Nicholson, above. Two years later (in 1808), Pitcairn had her first visitors. After landing her rum and gin at Hobart Town (to Bligh's disgust), the Topaz sailed north across the Pacific and chanced across Pitcairn with no inkling that it was inhabited. In his log, Captain Folger wrote: 'I discovered a boat paddling towards me'. It was a Tahitian-style canoe containing three young men 'as dark as natives' and almost naked. The 'natives' yelled to them- in English! Captain Folger had discovered a race of 'Noble Savages', a race which would have thrilled Rousseau himself. The people were 'tall, robust, golden-limbed and good-natured of countenance'. All were extremely athletic and adept at surf-board riding. Folger sent a copy of his log to the Admiralty in 1809 and, when this was ignored, personally wrote to them in 1813. Preoccupied with the activities of Napoleon, the authorities still chose to do nothing about punishing the sole survivor of a twenty-year-old mutiny; moreover, they apparenty disseminated this information to very few; possibly not even to Captain Bligh. Four years after Bligh's death, the Surry arrived at Pitcairn, her crew well aware of their responsibility to record accurate accounts of this intriguing race to add spice to the soirees of the British aristocracy and conviction to the hope of various religious groups that here were potential missionaries. On 10th December, 1823, the British whaler, Cyrus, arrived at Pitcairn bearing two men who were to introduce to the island its first (and almost its last) non-Bounty; non-Polynesian blood. As John Adams's wife, Teio, whom he called Mary, was now blind, Adams was finding It difficult to care for her and simultaneously cope with the teaching of an ever-increasing horde of children. Upon his request, Captain John Hall agreed to allow one of his complement to remain on Pitcairn in the role of school-teacher. This was John Buffett, a man with a remarkable history of survival. He had survived ferocious storms in Manila Bay and the Moluccas. He had been shipwrecked in the Bay of St. Lawrence, witnessing the death of 42 souls, then shipwrecked again south of Boston. In manner, however, this adventure-toughened seadog appears to have come across as a mild, soft- spoken scholar. His friend, John Evans, was not invited to stay but jumped ship and hid in a tree until Cyrus sailed. Bounty (in 1790) he found the community in fine shape. "The children are not swaddled and tormented as they are in England, in consequence of which they are strong and independent looking, not an ill-formed or deformed child was to be seen; they go into the water when very young, which tans their skins and renders them some shades darker than their original coloul: The women are as expert as the men in the surf, some of them being able to swim entirely round the island. The way they effect a landing is thus: One whose experience can be trusted mounts a rock that commands a view of the sea, watches for the proper moment, when, at a signal from him, the boat which has been lying as close to the breakers as possible makes a rush and, by takmg one of the less heavy breakers, goes flying in before it, frequently without a stroke of the oars being necessary except to steer her ... a trifling deviation on either side would dash it to pieces on the rocks." 1. "Dr David Ramsay ... Captain Folger ... Captain Wood"
Clarke does not reproduce his quotes from the original sources. In several cases the reference is simply "R.B. Nicholson's The Pitcairners". 2. "Captain Folger had discovered a race ... adept at surf-board riding." The implication that Folger, the first to discover an inhabited Pitcairn in 1808, also observed surfboard riding seems highly unlikely as he remained at Pitcairn for only ten hours. "The discovery was reported by Folger to the Royal Navy 1808, a report of which reached the British Admiralty on May 14, 1809. It was published in the Quarterly Review in 1810. Captain Folger also related an account of the discovery to his friend Captain Amasa Delano, who published the account in his book A Narrative of Voyages and Travels in 1817. This account is also included in the book Pitcarin Island, written by Charles Nordoff and James Hall." 3. "John Buffett, a man with a remarkable history of survival" - page 111. Buffett published A Narrative of 20 Years' Residence on Pitcairn's Island in The Friend, Honolulu, in 1846, Volume 4, pages 2-3, 20-21, 27-28, 34-35, 50-51, and 66-68. His recollections contain no account of the Islander's surfriding. Drowning, Bathing and Life Saving (2000) page 159. Surfing on Norfolk Island- Further Research. The following item is yet to be examined, but appears potentially interesting. Note the spelling variation of Patterson and Patteson. Society for Promoting Christian Knowledge: Sketches of the Life of Bishop Patterson in Melanesia. b/w plates. (illustrator). iv, 204 pp. The Bishop's adventures in New Zealand, Melanesia, Norfolk Island. It must be an early appearance of such a description. London : Society for Promoting Christian Knowledge, 1873? Picturesque Atlas Publishing Company, Sydney, 1886-1888, page 607. Studied in Germany before moving to America in 1874. He visited Australia (NSW) between c.1886 - 1889, and then returned to the US. Pitcairn Island - Refuge of the Bounty Mutineers. 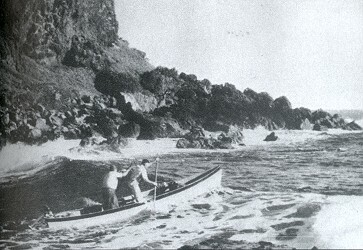 "Two islanders paddle their way out of the landing cove to catch fish. The waves breaking on the far shore give some idea of the danger of the task." - Refuge of the Bounty Mutineers. 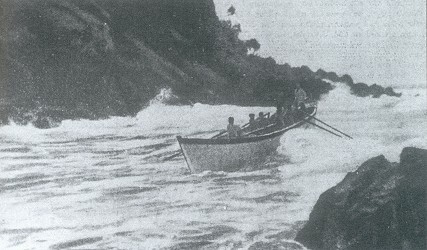 "A longboat returning to the Landing Place in heavy seas. Note the lookout standing in the stern who watches for a 'safe' wave before entering the bay." Geoff Cater (2009-2016) : Dr. David Ramsay : Surf-riding at Pitcairn Island, 1821.